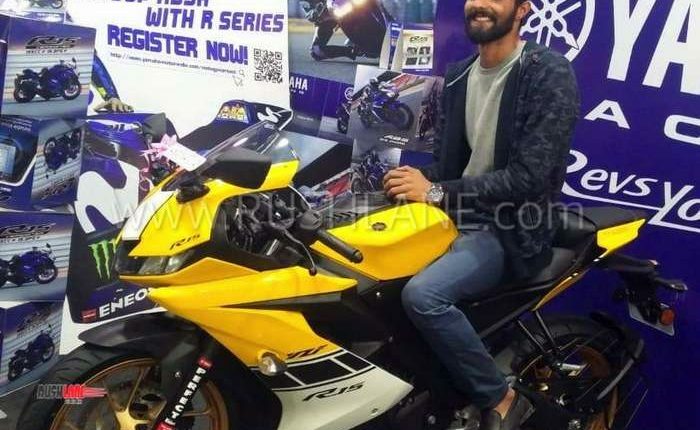 As of now, this is the only yellow coloured Yamaha R15 V3. Officially, the colour schemes on offer with the new 2019 Yamaha R15 V3 is Racing Blue, Thunder Grey and Darknight. 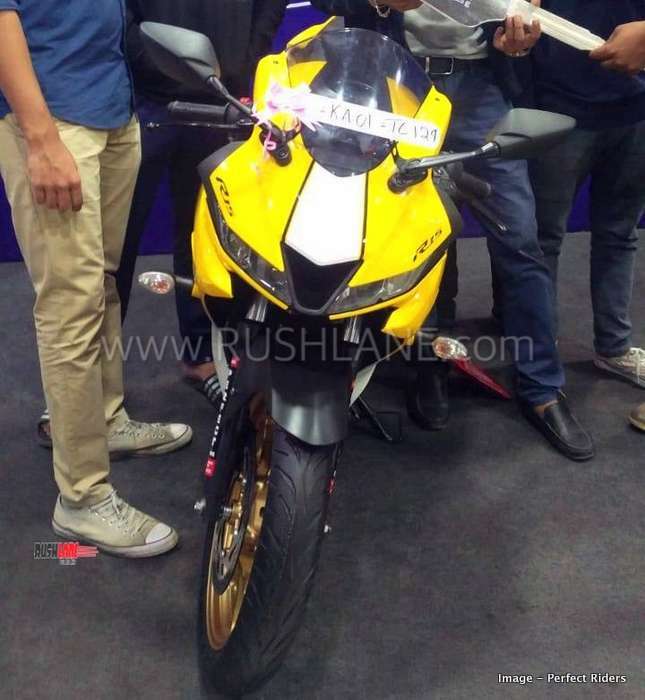 Now, a bright yellow colored R15 V3 has been delivered to first customer in Bangalore. This special edition version is priced higher than the existing colour options. 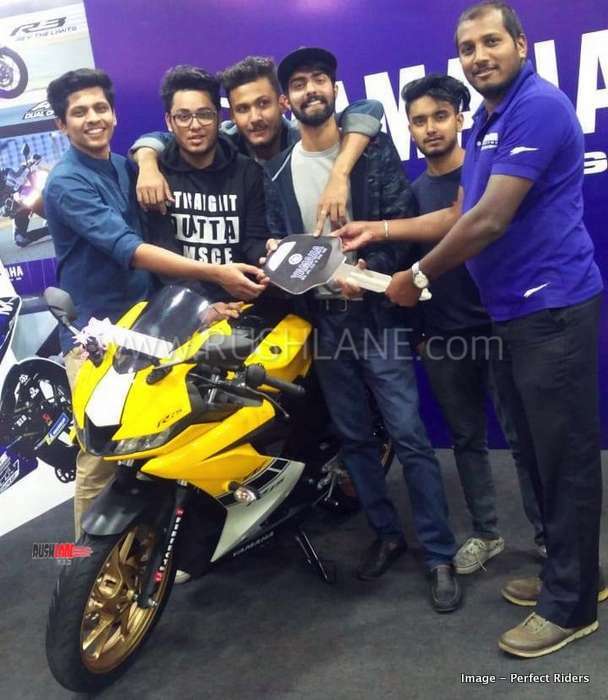 It has been custom made by Yamaha India dealer – Perfect Riders. The changes are purely cosmetic, and do not include any engine upgrades. The yellow coloured Yamaha R15 V3 sports a front fascia in yellow and white. The same color scheme is extended to the fuel tank. The yellow colour further extends to the sides while the central section is finished in black glossy paint. 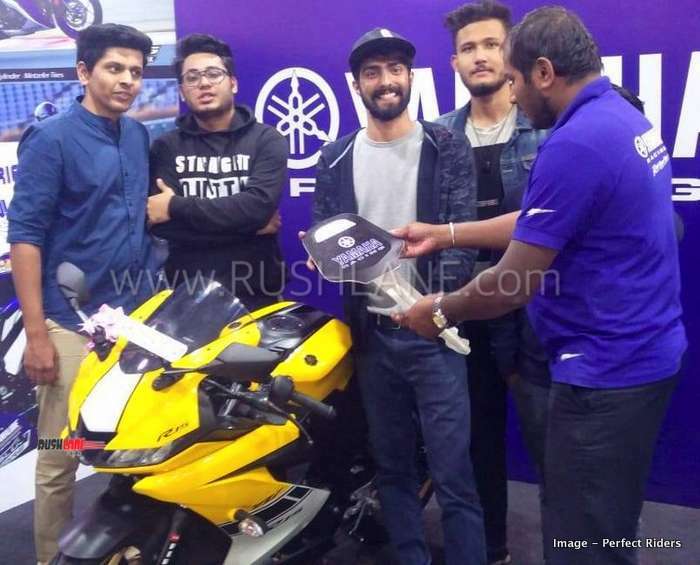 Owner of the new Yamaha R15 yellow edition. The rear winglets are also finished in yellow creating a striking contrast with black. These changes being purely cosmetic. 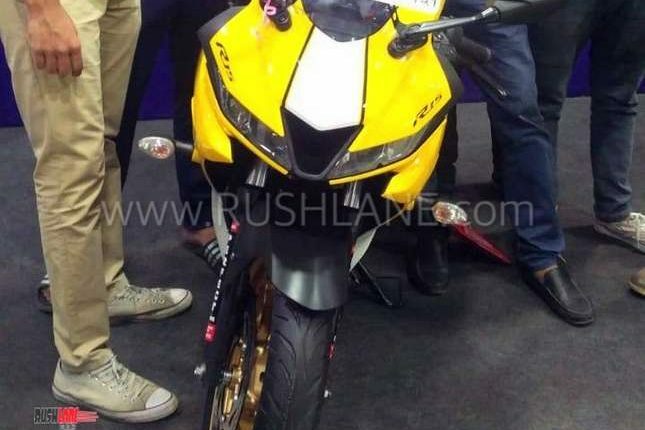 Besides the new paint scheme and golden alloys, Yamaha R15 V3 Yellow colour special edition receives no other change. It is powered by the same 155cc, 4 stroke, single cylinder engine offering 19 bhp power and 15 Nm torque. It is mated to a 6 speed gearbox with slipper clutch assist. 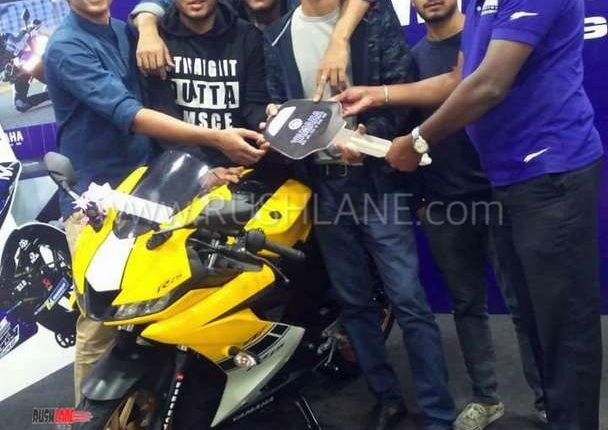 Yamaha R15 V3 is the company’s priciest offering in India in the 150cc segment. It comes with a price tag of Rs.1.39 lakhs for the Racing Blue and Thunder Grey colours. While Darknight colour option costs Rs 1.41 lakhs, ex-sh. Dual channel ABS is now standard across the range, thanks to new safety regulation. Yamaha offers the India-spec R15 V3 with telescopic front forks instead of upside down front forks seen on its international spec variant. It gets steel foot pegs as against aluminum foot pegs offered on the international spec model. These changes are done so as to retain costs at affordable levels in the country. 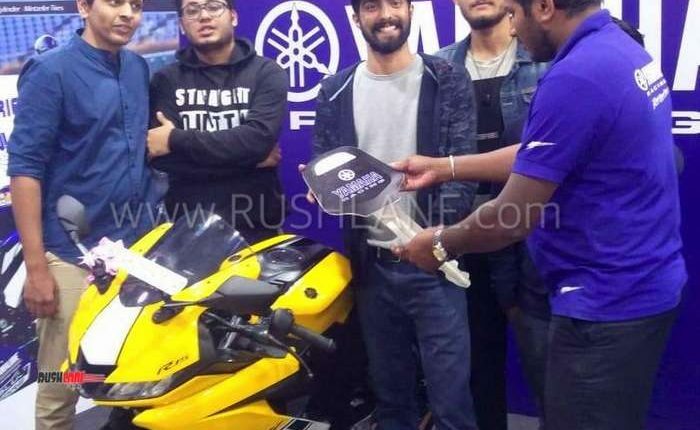 Yamaha is also set to introduce the new MT15, a street version of the R15, in India. It will be launched on 15th March 2019. The new 155 cc bike will carry a lower price tag than R15 V3. It will have the same engine as seen on the R15 V3. Price could be at Rs.1.20 lakhs, ex-sh. 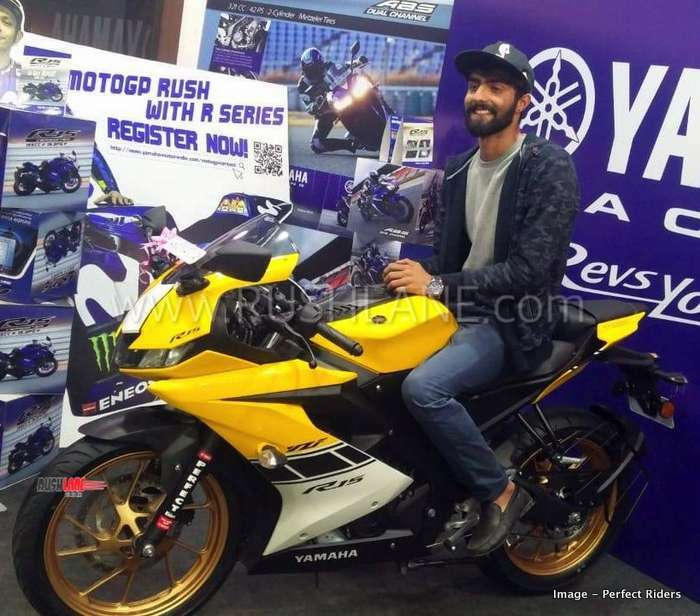 New MT 15 us set to compete with the likes of KTM 125 Duke and Bajaj Pulsar NS200.